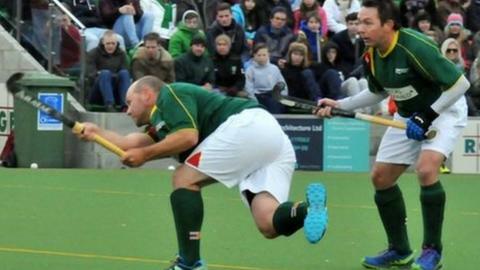 Guernsey suffered heartbreak in the EH National Trophy final as they lost to Sheffield University Bankers on flicks. Andy Whalley's side were looking to win the trophy for the second year running - and the third time in five years. The match at Lee Valley ended 2-2 after Steve Waldrom and Matt Stokes scored for the island side. Both sides then scored four of their five attempts in the shootout which followed, but Sheffield won with their third flick in sudden death. "We had a great day, we played very well, but we came up against the best side in the tournament, really," player-coach Whalley told BBC Radio Guernsey. "Our disappointment probably stems from the fact that we got ourselves 1-0 up, then 2-1 up, but just couldn't quite close out the game at that stage. "We've come an awful long way in four years. Our standard of play has moved up to a different gear. "We've got incredible strength in depth, we've got a young, fit side, but we probably learnt a couple of lessons from the game - they were a little bit fitter than us and probably closed down a little bit harder."